More than 4,000 geraniums were unearthed and given away this morning at Bowling Green Park by The Alliance for Downtown New York, marking the third annual Adopt A Geranium event. This event, which is part of Downtown Alliance’s larger Going Green Downtown initiative, provided free geraniums to anyone who lives in, works in or visits lower Manhattan, according to a press release from Downtown Alliance. 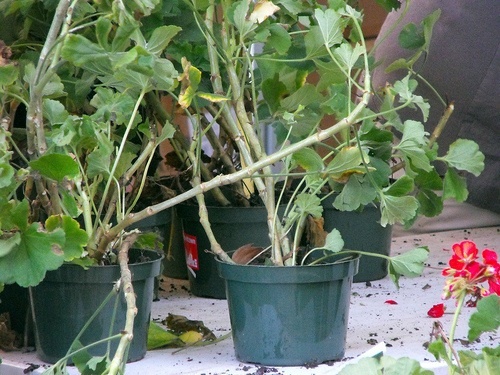 Although geraniums are unable to survive a New York winter outdoors, Berger said that they are able to survive indoors, hence why they were being given away to the public now. The flowers were dug up by horticulturalists from Nielsen-Elefante Nurseries, located in Lincoln Park, N.J., potted and placed into recyclable tote bags for distribution. Visitors were permitted to take multiple pots, resulting in many people acting as the gofer for friends, neighbors and co-workers. “We wanted to invite the community to come meet each other, help lower Manhattan stay green and get a little dirt under their fingers,” Berger said. Many of the visitors at the event, which was held from 10 a.m. to noon, said they had little time to spare, as they had to “sneak” out of work to make it. Peggy Shecha, 32, of Sheepshead Bay, said although the event was a great idea, she wished it was at a different time. Shecha added that she planned to give a geranium to a neighbor whose garden was uprooted and destroyed due to construction. The event didn’t just draw avid gardeners though. According to Forde, he also furthers sustainability for a living; he is currently developing LEED certified buildings for Milford Management, a company known for its luxury rental properties Downtown and on the Upper East Side. Tom Farrell, 44, of Park Slope, said that this isn’t his first time adopting a plant from a New York City park. Downtown Alliance is an “organization that provides Lower Manhattan’s historic financial district with a premier physical and economic environment, advocates for businesses and property owners and promotes the area as a world-class destination for companies, workers, residents and visitors. (And serves the area) from City Hall to the Battery, from the East River to West Street,” according to their website, downtownny.com. According to James Yolles, 29, of Morningside Heights, Director of Public Affairs at Downtown Alliance, a Fall Community Planting Day will be held on Saturday, Oct. 23 from 10 a.m. to noon in Bowling Green Park. At this event, volunteers can plant tulips in preparation for the spring; Downtown Alliance plans to provide all gardening tools and refreshments.